 There are so many options for poly pipe fittings here at PlumbersStock; you are certain to find what you need. 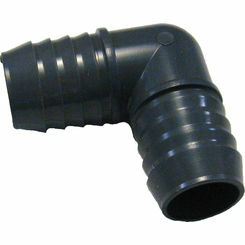 More commonly referred to as poly fittings, you will love how easy they make it connect polyethylene pipe. Find out for yourself why so many choose us for discount fittings. We have everything you need to get you going on plumbing and irrigation projects. 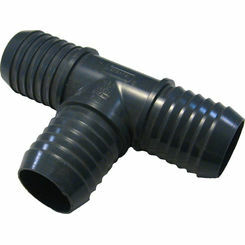 Among many other things, poly pipe fittings are great for sprinkler fittings. Here at PlumbersStock, we sell a wide variety of Polyethylene fittings and fittings compatible with poly pipe (AY McDonald, Blazing, Clayton Mark) and we can help you find what you are looking for. If you are a little unsure of what you need, the following information may provide valuable insight into these fittings and their purpose. 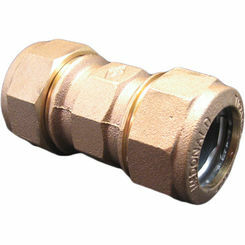 There are poly fittings, but they are rarely used and typically only in industrial application. When we refer to “poly fittings”, we mean fittings made of materials that are compatible with poly pipe. Below are many different types of fittings, with individual characteristics depending on the project or job that you are working on. 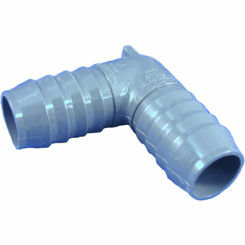 PVC fittings are plastic based fittings commonly used with Polyethylene Tubing. 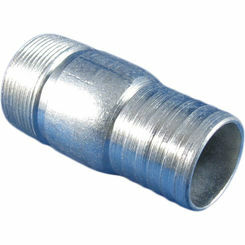 Galvanized Steel fittings are non-corrosive and are rust-resistant which works well with water applications. Brass fittings are used with Tuff Tubing, which is another type of Polyethylene Tube explained below. Polyethylene Tubing vs. Tuff Tubing? 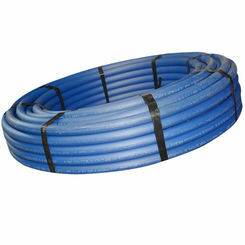 The Polyethylene Tubing is a standard pipe which is rated at 100psi (Pounds per Square Inch). 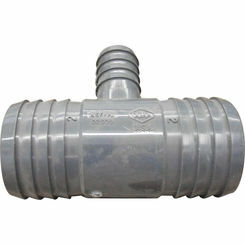 The corresponding fittings are barbed and are inserted into the pipe. Depending on the project, hose clamps may be needed for a more secure application. 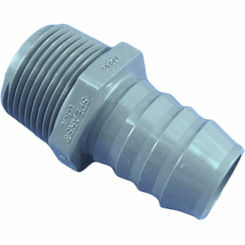 The fittings are also made of either plastic (PVC) or galvanized steel. 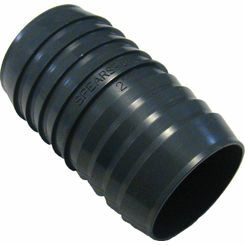 Tuff Tubing, however, is a pipe that is a bit thicker and is rated at 200psi. 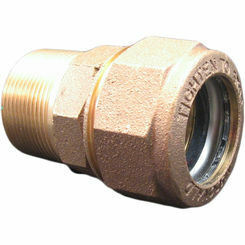 The Tuff Tubing is also a Poly Pipe, which uses brass fittings. 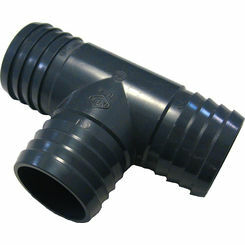 Unlike your standard Polyethylene Pipe, the Tuff Tube is inserted into the fittings and is secured down by a nut, or bolt and screw depending on the type of fitting being used. The pressure going through these tubes requires a strong fitting hence the name, “TUFF TUBE”. 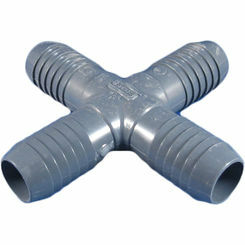 The Coupler fitting allows you to connect two pieces of pipe together. Tee fittings allow you to split the line into two run-offs with the tubing. 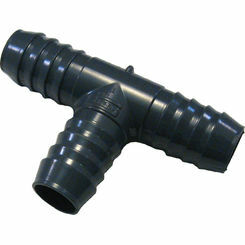 Here at PlumbersStock we also have Cross fittings which allow you to turn your one pipe into three. 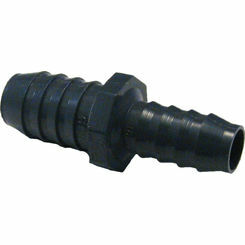 The Reducer fitting allows you to go from one pipe with a given diameter into a smaller one. 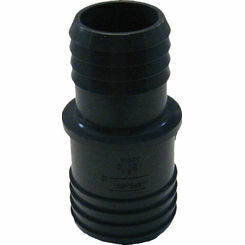 Elbow fittings allow you to change the direction of your piping/tubing in a 90-degree angle. 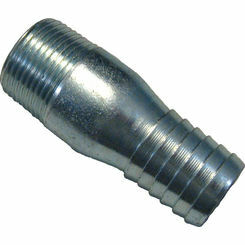 The Adapter fittings can help when it is necessary to go from a male to a female connection. 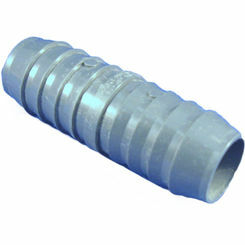 Also for a connection that uses Tuff Tube, and you are going from the Tuff Tube (Bolted Down, or tightened with a nut) to a threaded connection. Here at PlumbersStock, we are dedicated to both the contractor and the do-it-yourselfer. With our wholesale prices and professional staff, this is the BEST place on the web to get your Poly Fittings for your next job. If you have any questions or are having trouble finding the right part for the job, please contact us, and we will be happy to help.